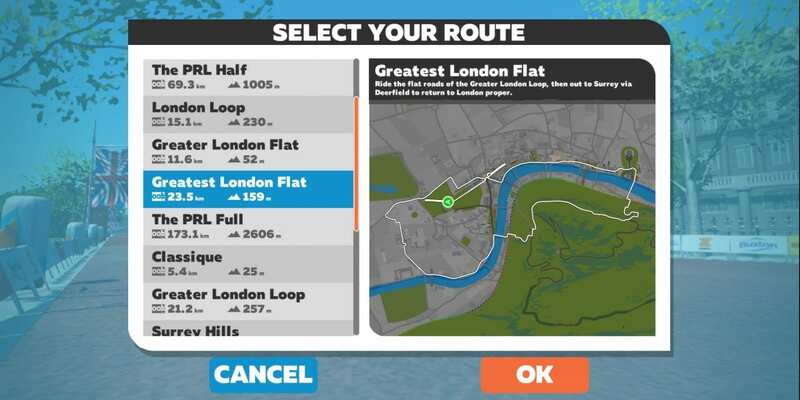 London’s “Greatest London Flat” was released with Zwift’s February 1, 2018 update and is the longest “flat” route on the London course. If you choose this route, the game will spawn you on Constitution Hill near Buckingham Palace, riding in what is typically the reverse direction (westward). Since riders are placed at various points near Buckingham Palace on Constitution Hill, we chose to start our Strava segment at the Classique banner which is approximately 1.5km from the spawn point. A free ride of Greatest London Loop begins on the Classique route, but only covers a portion of it before turning onto the Greater London roads. You are then taken over the bridge, through the subway and into the “Richmond Park” countryside which was part of the January 2018 London expansion. The subway tunnels carry you back into London, over the bridge and through the start/finish banner. The link for the extended version currently points to the standard version. Looks like that link was updated but still doesn’t go to the new extended Stava segment. When I recently did Greatest London Flat, it took me on a route somewhat different from that described in this article and from that posted by Dan (https://www.strava.com/segments/16940283). The first part was the same. However, at about mile 15.3 miles (24.6 km) into the segment posted by Dan, instead of turning me left to head toward the start gate in reverse direction, it took me right and onto the London Loop course: up and over Box Hill, back down the other side,and through the start gate. Just when I thought I would just continue on toward another London Loop lap, it then turned me right at the intersection I mention above (at mile 15.3) and back onto the Classique route in the reverse direction, shortly after which I stopped. Regardless, I wish it just stuck to the flat only, as I was hoping for some more non-climbing variety in London. Updated the link above for the extended segment, sorry about that folks! This is a nice recovery ride, just wish they could get rid of that subway link. Pedro, it looks like my experience with Greatest London Loop is the same as yours. On the first occasion that I selected this route, the first 28 miles (45 km) were exactly the same as your first 28 miles (https://www.strava.com/activities/1393595578). I stopped riding at that point, so I can’t say what would happen if I had kept going, but presumably it would have continued to be the same. This morning I tried the route again, but for only 22 miles (35.5 km), and, again, that length matched your routing. Update–sounds like the random routing after completing the initial route is a bug which will be fixed in the next update, probably this week. So I’ve removed all mention of the “extended version” above. No idea why Zwift made this a one lap course. When you choose a flat course and wind up in the Surrey Hills after one lap … you can imagine some getting aggravated. I hope this was just a routing error, and that it will be fixed with the next update. Good news! Zwift updated this route in last week’s update, so you can ride multiple laps just fine. I updated the segment links above to reflect the change. Anyway to request a “London Mega Pretzel” route? That would be nice fore longer rides.